I am currently still working on the new Item system. I cannot release an update until it's finished, as the current state breaks a few things. Changing a lot of code all over the game tends to do that though. Next update should be out by friday. AAAAANNNNNNNND, It's update time once again! -Switched from a dependency on GM objects for Items to an intricate grid system. -Old saves no longer work with the new systems in place, sorry. -Farmland is now bought via the properties/real estate shop. Some beginning plots are there to allow you to start off. -Some new art from the amazing Ninety has been added, with more on the way soon! -The new pause menu has some options available IN GAME NOW! WOO! Key mapping is coming soon too, so you can do it on the fly. -Map layout reversed. Town is now to the right of the Homestead. It's dated yesterday because that's when I built the Windows version. Linux was built today with no changes to codebase. 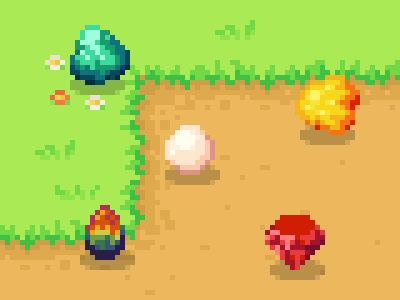 5 of the many gems you can find in the game. Fully grown cabbages, ready to be harvested. So, I'll share with you what the next update is going to have instead! That's right! Get to know some people in the valley, and maybe you'll fall in love? That's right, a feature I myself am really excited about! While away your virtual spare time by fishing! Maybe you'll catch the biggest fish in the Fishing Tourney every season! Those are the major two, some other small stuff is a new shop in town, and more NPCs to interact with. I've done a lot of work on smaller parts of the game like mining and fishing, however, adding NPCs proved difficult. The few in the game now are mostly just tests of how they interact, but they don't really fully show what I plan NPCs to be like. I've recently gotten some design help from a good source, and will be prototyping and debugging over the next few days to see if I can get it working. The graphics with the gems look much better. If you update your art you would probably get more feedback! Hey RujiK! (Artist/musician here, if you didn't know.) We're still hard at work on the art redo, there's a lot going on behind the scenes. Almost all of the items have already been done, and all the art for farming will have been completely redone in a couple of days. This looks pretty neat, keep up the good work. Have you thought of it being an open world multiplayer, as you know its always good t play with friends , if not open world then maybe just invite only to your world ? The thought has been floating in my mind for a while(multiplayer), and I have decided against it, at least for now. I'm capable of doing the networking, but I don't feel like the game actually benefits from multiplayer, and I don't want to just tack it on without reason. With the feature list I have now, plopping multiplayer in at this point would increase my workload tremendously, and slow updates down significantly as the networking would also need updating with new features. For now, no multiplayer, in the future, it's quite possible. Crop growing sprites, now per crop instead of all being the same. I'm hard at work trying to get these new features working. I plan to have a new update out before month's end, hopefully on the 15th. I've plowed through a lot of bugs in the last few days. -A lot of NPC stuff, like holy moses, this is getting intense. I'm getting the systems in place though! -I reworked some of the new mine stuff, so they propagate correctly. -I fixed the issue of plugging in a gamepad making a standard Message. It now creates a special Notification class, that fades on it's own and doesn't obstruct the screen. -I've worked tremendously on the story, I really think any fans of Harvest Moon will like it. Especially if you're a Magical Melody or Animal Parade fan. I'm getting really interested in this game, great potential here. Do you have any plans to have a video showing us around in game? I want to make sure the features in game currently are solid before I record though. I want to start doing maybe monthly devlog videos, showing new stuff and what not. I've been pretty slow with game progress for a myriad of reasons lately. I was a tad burned out on the npc thing, but finally have a system that should work planned. I've been getting new art and even a new music track from Ninety. I'm getting back into game dev, and also teaching myself C# for future (non-homestead)development. Updates have been slow, and may stay that way for a while, but it's only because I want the game to be good. I really love the look of those Gems! I adore farming games like these. I played the demo you have available (2.10?) and I think the my real issue with it is the controls. I had a very difficult time getting things under control. It was particularly confusing when the game went from "[space to continue]" to having the enter key be the confirm key, and then enter does nothing notable in game. Even in the seed shop you use space to confirm things. The shifting between enter and space is due to me switching control schemes a while back. I've yet to track down all the bits that use the Enter key. Correction, I just went through and fixed this! Next build should be consistent on this! Really pushing to get this stable for an update. I'm not gonna put a date on it, as every time I do I blow past the deadline, but soon. Doing some top secret testing on something I've been wanting to do. And by top secret I mean, here's screenshots! In case you can't tell, these are of Homestead running on my Amazon Fire(5th gen). Full game, not a mobile port. Hoping the next update will have all the minor issues worked out. Work has been slow, hence the hold up of updates. Sorry! Cool, I'd love to have a farming rpg on my mobile (you know, one that doesn't require you to click on something and wait fifteen hours for your 'energy' to recover if you won't pay through the nose). Question: are you sticking with the font in the info boxes? It feels a little out of place besides all the chunky pixels everywhere else. None of the fonts used are final choices, no. That has been one of the biggest issues I've had. Since we're changing all of the art, it's hard to settle on a font until all of the art is redone. I'll probably switch back to my previous font until more art has been changed. Also, I'm pretty committed to making this the "anti-farmville". I despise the idea of in-app purchases, and feel content should be provided via updates not paywalls. I'm trying to fix a few small things and push an update, possibly even an android demo, but I'm having issues. Some new arts put in the game. Still hammering out some bugs and working on NPC stuff. I've a helluva lot of debugging to do.